This post originally appeared over on the Maptia Blog. The team at Maptia are creating a beautiful platform for telling stories about places (launching soon!) and you can check out their 'See The World' manifesto here. The relationship between words and their meaning is a fascinating one, and linguists have spent countless years deconstructing it, taking it apart letter by letter, and trying to figure out why there are so many feelings and ideas that we cannot even put words to, and that our languages cannot identify. The idea that words cannot always say everything has been written about extensively -- as Friedrich Nietzsche said, "Words are but symbols for the relations of things to one another and to us; nowhere do they touch upon the absolute truth." No doubt the best book we've read that covers the subject is Through The Language Glass by Guy Deutscher, which goes a long way to explaining and understanding these loopholes -- the gaps which mean there are leftover words without translations, and concepts that cannot be properly explained across cultures. 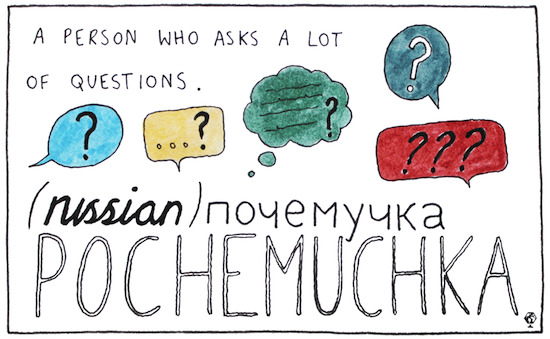 Somehow narrowing it down to just a handful, we've illustrated 11 of these wonderful, untranslatable, if slightly elusive, words. We will definitely be trying to incorporate a few of them into our everyday conversations, and hope that you enjoy recognizing a feeling or two of your own among them. 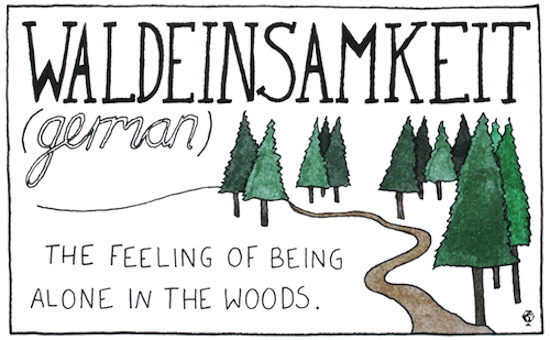 A feeling of solitude, being alone in the woods and a connectedness to nature. Ralph Waldo Emerson even wrote a whole poem about it. The mark left on a table by a cold glass. 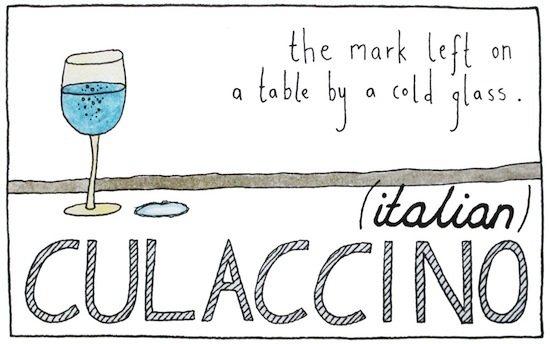 Who knew condensation could sound so poetic? The feeling of anticipation that leads you to go outside and check if anyone is coming, and probably also indicates an element of impatience. 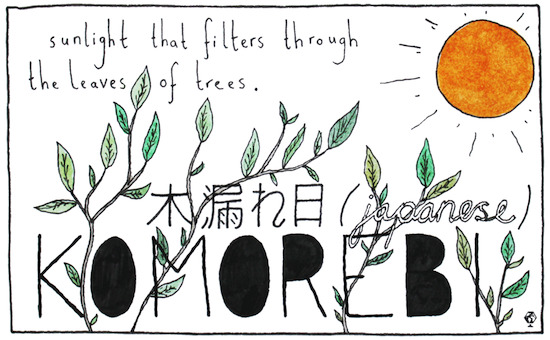 This is the word the Japanese have for when sunlight filters through the trees -- the interplay between the light and the leaves. Someone who asks a lot of questions. In fact, probably too many questions. We all know a few of these. 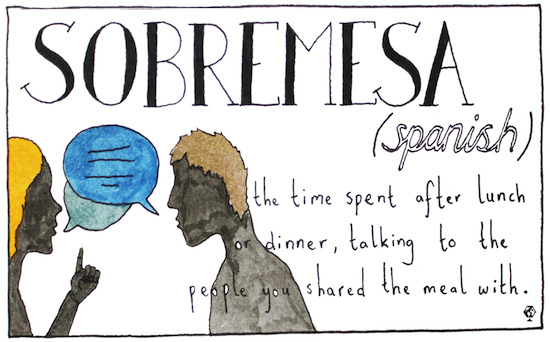 Spaniards tend to be a sociable bunch, and this word describes the period of time after a meal when you have food-induced conversations with the people you have shared the meal with. 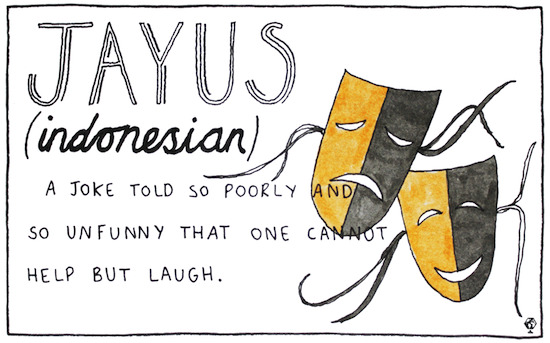 Their slang for someone who tells a joke so badly, that is so unfunny you cannot help but laugh out loud. 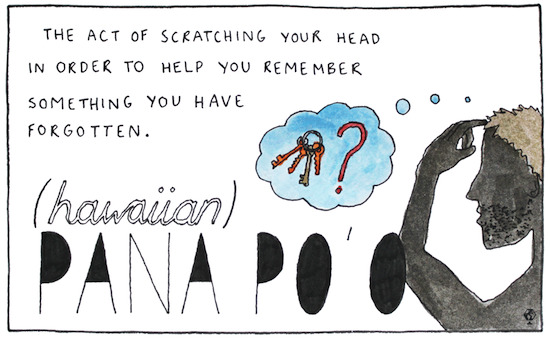 You know when you forget where you've put the keys, and you scratch your head because it somehow seems to help your remember? 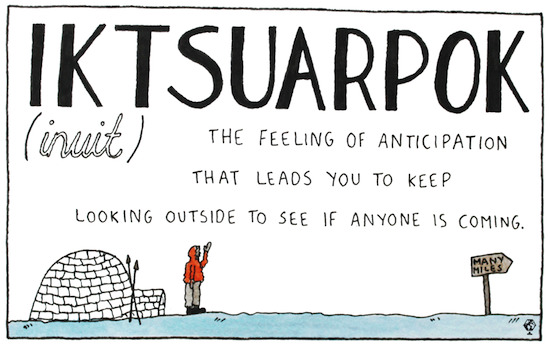 This is the word for it. 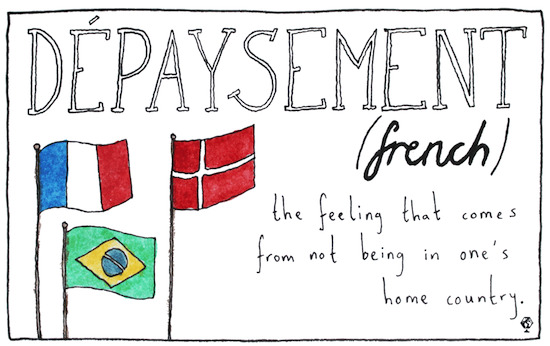 The feeling that comes from not being in one's home country -- of being a foreigner, or an immigrant, of being somewhat displaced from your origin. Urdu is the national language of Pakistan, but is also an official language in 5 of the Indian states. 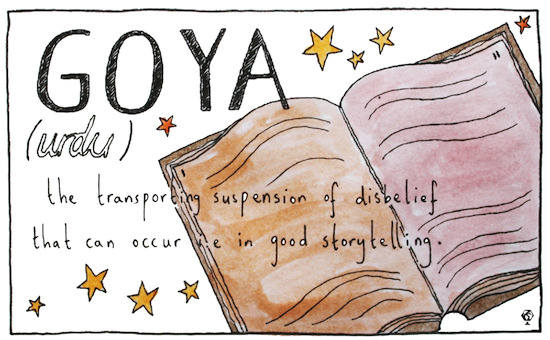 This particular Urdu word conveys a contemplative 'as-if' that nonetheless feels like reality, and describes the suspension of disbelief that can occur, often through good storytelling. 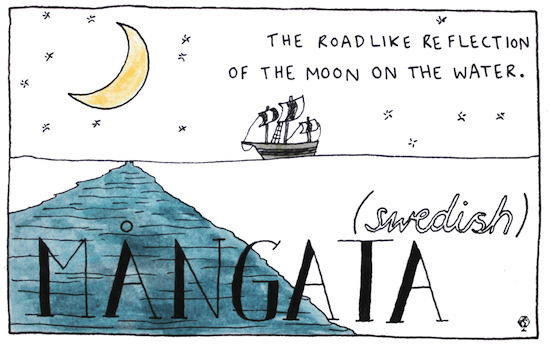 The word for the glimmering, roadlike reflection that the moon creates on water.